This report describes how Crossrail looked to develop its Occupational Health and Wellbeing strategy and worked with an external partner to define, improve and implement its approach. The paper will be of use to any organisation looking to expand their approach to improving the wellbeing and mental health of their workforce. 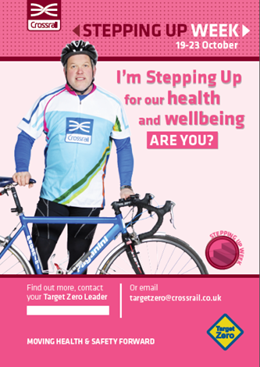 Over a two-year period, Crossrail, supported by Robertson Cooper and other suppliers, created and implemented a range of resources and activities designed to deliver the six-step Wellbeing Programme. The aim of the Wellbeing Programme was to raise awareness about wellbeing and support the achievement of the organisation’s strategic aims in order to leave a lasting legacy of improving wellbeing and mental health within the construction industry. A definition of wellbeing was presented in the strategy to ensure clarity around the broad reaching definition of wellbeing intended by Crossrail. This helped to clarify that wellbeing meant more to the organisation than just either physical or psychological health. It was a holistic definition which incorporated physical, psychological, social and mental health. This definition was still somewhat technical to the average employee or contractor and so, in year two a deliberate move was made towards focusing on Robertson Cooper’s “Good Day At Work” message as the vocabulary for wellbeing at Crossrail. The message is a simple and very accessible one: we feel better and are able to do our jobs better when we have a good day at work. Wellbeing at Crossrail is therefore about understanding and taking action to create more good days at work for everyone. The language and the logo of Good Day At Work was used in wellbeing materials, training and programmes (as outlined below) to create this shared, common vocabulary. When the Health and Safety topic was Sun Awareness, wellbeing bulletins were produced which promoted the mental health benefits of spending time outdoors (whilst following sun safety guidelines). When the Health and Safety topic was Cancer, the wellbeing bulletin was about the psychological impact of living with long term illness and how to support yourself or colleagues in such a situation. When the Health and Safety topic was Exercise, the wellbeing angle was about how physical activity is about more than just the physical benefits of getting fit and losing weight, but that physical activity is also one of the best ways to combat stress. Getting wellbeing onto the agenda for the monthly Health and Safety “Toolbox Talks” and encouraging people to volunteer to deliver a toolbox talk on a wellbeing subject that they had personal experience of (such as depression). Champions training: to build the wellbeing champions’ skills and confidence in breaking down stigma and talking about wellbeing. This was delivered with the intention for champions to be able to coach managers to have more effective wellbeing conversations with their teams as well. Resilience Training: personal resilience training was offered to give individuals the skills and knowledge they need to build their own sustainable capacity to cope with pressures, challenge and set-backs. Mental Health First Aid: a number of people across the organisation were invited to attend external training to become Mental Health First Aiders. This was intended to build the organisation’s capability to support those who are experiencing the signs and symptoms of stress, depression, anxiety and other mental health concerns. Energy Kick Start Programme: run during Health and Safety Stepping Up Week this programme was designed to educate staff about health related behaviour. At the end of the programme each participant was provided with a “Keep It Up Self-help Resource Pack to support them in sustaining positive changes made during the programme. No More Ostriches: this was a short, focused line-manager workshop aimed at giving people the skills and confidence to talk more about wellbeing and mental health issues at work. Creating a Mental Health and Wellbeing element of the Health and Safety maturity matrix which all sites were audited against. This stage of the programme was about activating behaviour change; giving people the chance to get involved and do something that would make a difference to their health and wellbeing. At one level this was about making sure that in all the literature (leaflets, posters, bulletins etc) that were produced about wellbeing, practical tips were included about what an individual could actually do as a result of what they had learned through that information. For example, the bulletin about the power of physical activity to combat stress included a list of tips for building more physical activity into your daily routine. One of the positive lessons learned from the programme was the importance of the wellbeing champions network. Feedback and participation rates reinforced the original expectation that central activities would not reach staff at other sites and so locally driven activity was the right course of action to take. Given that approach would be recommended for future project with organisations of a similar structure and geographical spread, then another lesson learned was the importance of having a wellbeing programme aligned to a wellbeing strategy. The wellbeing champions were an important conduit for driving local activity, but the freedom they were given to do that meant there was a risk they would focus on areas of personal interest. Having the wellbeing strategy created the necessary central focus which enabled constructive, objective challenge of local activity plans to ensure that the topics and activities were broad enough to cover the breadth of focus that Crossrail intended. “When I hear that an activity made a real difference to just one person then I know it was worth it”. Katie Dodsworth is a Chartered Occupational Psychologist with Robertson Cooper. Katie has worked as a consultant for over 18 years, specialising in helping organisations to get the most out of their workforce through effective selection, development, retention and organisational change processes and strategies. Katie is a firm believer in the power of positivity; working with individuals, teams and whole organisations to leverage their strengths as a means to bringing out the best in people and enabling them to perform to their full potential, even in the face of adversity.